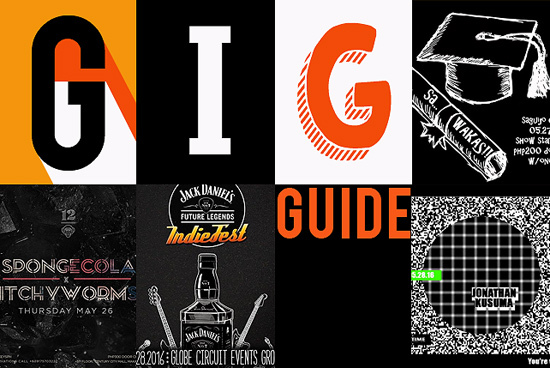 This week's must-see gigs, parties, events. 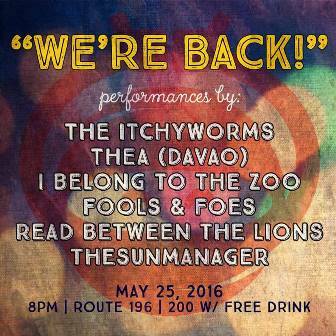 Why you should go: It's been a month since Route 196's anniversary and they're back with a gig! Watch performances from Fools and Foes, I Belong to the Zoo, Read Between The Lions, Thea, Itchyworms, and TheSunManager. Other details: Gates open at 8 p.m. Tickets are P100 before 9 p.m. and P200 from 9 p.m. onwards. Why you should go: It’s sure to be a fun night when two of the biggest bands in the country play back-to-back. 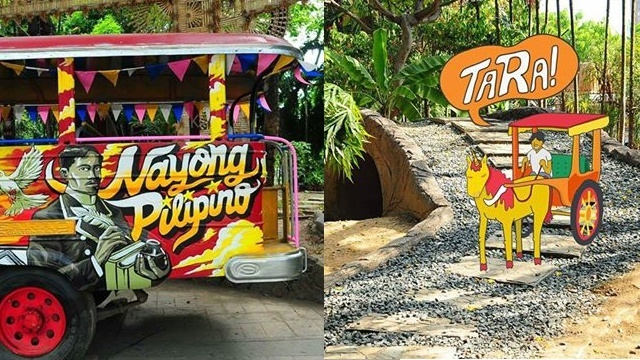 Catch Spongecola and Itchyworms perform their hits live at 12 Monkeys on Thursday! Other details: Be there at 9 p.m. P300 door charge. For table reservations, contact 0917-570-3222. 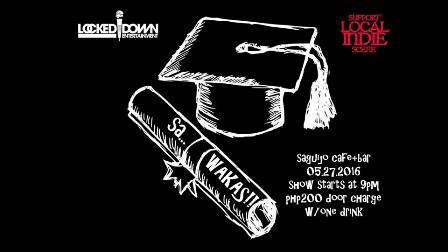 Why you should go: Celebrate your graduation with the people from Locked Down Entertainment, and music from Flying Ipis, Pedicab, Cheats, Assembly Generals, Tarsius, and Thea from Davao. Other details: Show starts at 9 p.m. P200 gets you in with a free drink! 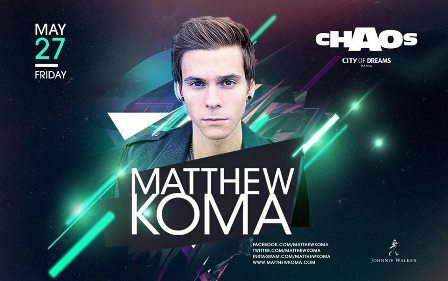 Why you should go: Chaos is making it official: They're having DJ Matthew Koma live on Friday! Time to sing and jump to his worldwide crowd favorite tracks. Resident DJs David Ardiente and Jet Boado will also be spinning. Other details: Be there by 10 p.m. For VIP table reservations, contact 0917-381-3398 or e-mail ChaosTableReservations@cod-manila.com. 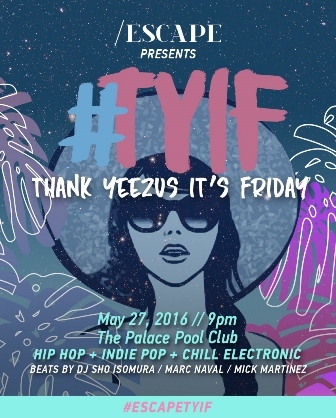 Why you should go: Enjoy a night of '90s hip-hop, indie pop, and electronic music—the perfect mix for a cool, chic, and chill night at The Palace Pool Club. 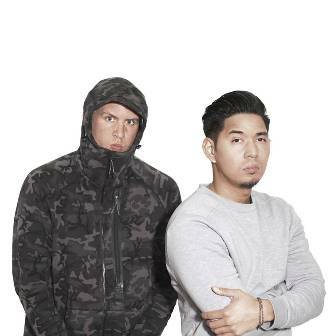 Beats will be served by DJs Sho Isomura, Marc Naval, and Mick Martinez at 9 p.m. until morning. 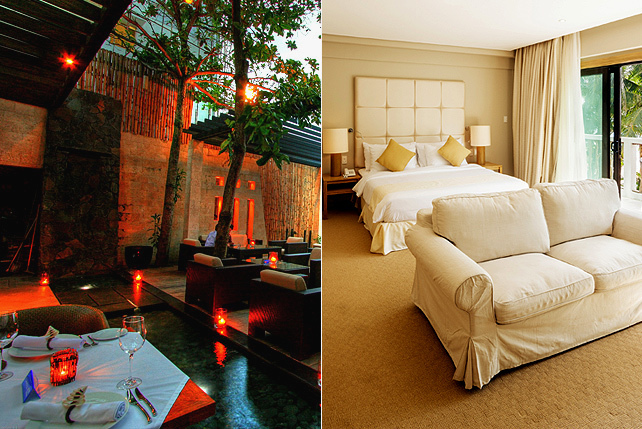 Other details: Party starts at 9 p.m. For inquiries and reservations, contact 0917-689-8888. 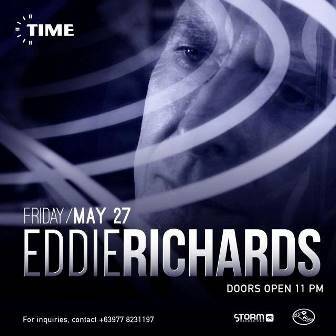 Why you should go: After his wicked five-hour set for their 4th anniversary, TIME welcomes back Evil Eddie Richards—dance music's quintessential pioneer and Britain's Godfather of House and Techno. Performing with him are Arlyn Muñoz, Alex Catalan, Alinep, Martin Lugtu, Pav Parrotte in the Main Room, and Br3akingsilence on the Roof Deck. Other details: P700 discounted guest list before 1 a.m. P1,000 before 2 a.m. with a free drink, and P1,500 after 2 a.m. with a free drink. For inquiries, contact 0977-823-1197. 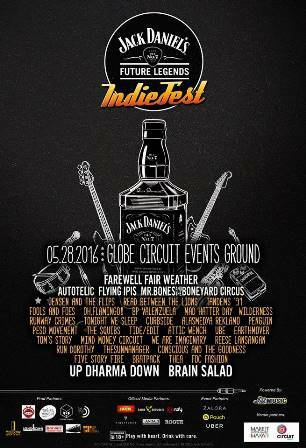 Why you should go: The Jack Daniel's Future Legends INDIEFEST is a grand celebration of Independent Music! Happening only every two years, this 2016 is the second time Jack Daniel's Philippines will be holding this festival, now with over 30 bands performing in a total of three stages. Other details: Gates open at 3 p.m. Get free tickets by joining Radio Republic’s exclusive and extended promo on Facebook. Send them a message when you submit your entry! Why you should go: You don't have to look any further because TWRK will give you just what you're looking for—madness and party all night long! 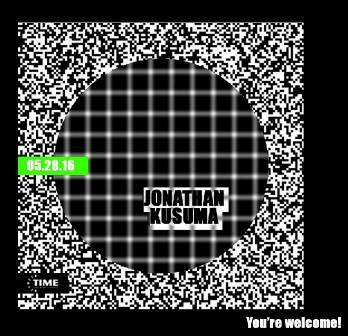 Why you should go: Jonathan Kusuma is a musician, producer, and DJ based in Jakarta and Singapore. His latest EP is entitled Black Magic and he's ready to bring the party to Manila. Other details: Doors open at 11 p.m. Get in for P800 before 2 a.m. and P1,000 after 2 a.m.
Why you should go: Bring out your inner rock star and take over the stage. 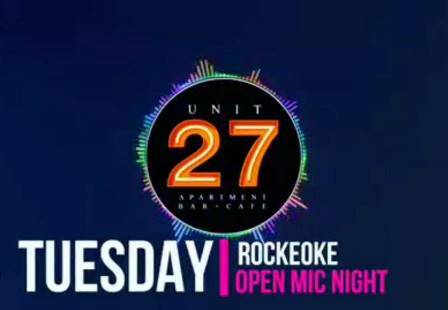 This is your chance to fulfill your rock star dreams, together with Trinidad on Tuesday at Unit 27 Bar+Café. Other details: Event starts at 9 p.m. Free entrance!